Found 4 file extension associations related to File Conversion Center and 1 file format developed specifically for use with File Conversion Center. Able to convert Microsoft Office documents such as Word, Excel and PowerPoint files, Adobe PDF files, PostScript files, HTML files and web pages, as well as other popular file formats into non-searchable Adobe PDF documents, TIFF, JPEG and other image file formats, File Conversion Center is an indispensable tool for all your conversion needs. Convert any number of files, folders, and web addresses. Pause, resume, skip a file or cancel the conversion process from the progress dialog. Integrated into both your desktop and your Windows Explorer application, you can convert individual files or groups of files on demand, quickly and easily. Convert any file that can be opened and printed by any of the supported applications. As new file extensions are encountered that can be opened, they are added to the list of files types that can be converted. Custom conversion settings can be created to meet your specific needs; output file type, resolution, color, serialized or multi-paged files, compression options and output file location, as well as auto-rotating landscape pages, trimming white space, cropping and resizing can all be configured. Folders can be processed recursively, saving the converted files with the source file, or in a new location with the same directory structure. 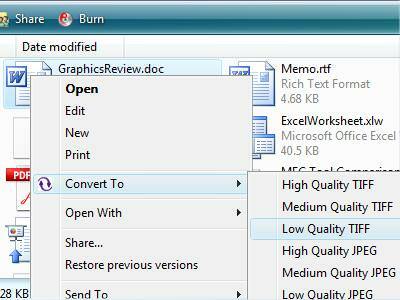 Folder contents can be filtered by file type to convert only the files you want. Convert documents into image files and send them to your office printer with the same mouse click, simplifying your workflow process and saving you time. If you need more information please contact the developers of File Conversion Center (PEERNET Inc.), or check out their product website.